Bike Commute Tips Blog: Buying a Bike: new or used? Buying a Bike: new or used? A question I receive frequently from visitors to my Bike Commuting Tips site is: Should I buy a new or a used bike? Motivated by higher fuel costs, expanding waistlines, or growing traffic, many visitors ask if they should refurbish their old bike now deeply dusted by decades of garage exile. Or should they buy new? My advice to people new to bicycling or resuming cycling after several years is to buy a new bicycle, for many reasons. New bikes come with full warranty protection, in the unlikely event of problems. Newer bikes are less prone to mechanical failures, and most bike shops offer a 90-day "break-in" period where they'll make minor adjustments. You can find just the right combination of color, fit, style, and options buying new, where you have less choice buying a used bike. Bike technology has also improved markedly in recent years, especially shifting, braking, and frame materials--newer bikes simply work better. It is true that you can often find great deals on a used bike. I've enjoyed finding those great older bikes and fixing them up into outstanding vintage cycling machines, as I did with my older Trek touring bike. However, buying a used bike, just like buying a used car, is risky. If you don't know exactly what you want or if you lack the mechanical skills to adapt a used bike to your needs, then you should buy a new bike. Again, the most important consideration isn't price, but comfort. Get the right bike. I always discourage people from buying a "boat anchor disguised as a bike with a 'Motiv' label" from a big box store. Buy from a reputable bike shop. With the growth of the Internet as a sales venue, I also discourage newbie bike commuters from buying a bike without riding it. Buy new, is what I generally advise. A new bike is a great motivator, and a new bike works better right from the start. That said, it is true that great values can be found on used bikes. 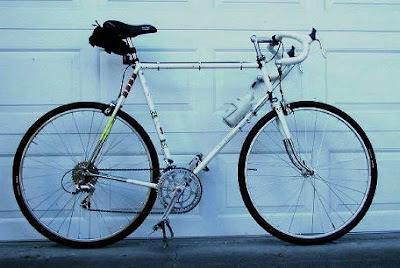 I once found a sweet Peugeot UO-8 (similar to bike above, a gem PX-10) for $10 at a yard sale. After hours of enjoyable degreasing and reassembly--gotta love a project!--I had a hugely fun lugged steel bike with classic French geometry. What do you suggest to prospective bike commuters? New or used? Definitely used. I saved a lot of money buying a 3-year old Fuji road bike that works great and it came already equipped with some great accessories too! Just do your research first. Plus, it's good for the environment. It depends, as with almost all things. I've owned and ridden many bikes. The biggest problems are "hidden" ones--a cracked frame, a bad hub, etc. I think more importantly, the best option is a decent quality bike, used OR new, rather than an "el cheapo" junk bike that is new. I once had a "Free Spirit" bike (Sears); enough said. Shelter for smokers, not bikes? Critical Mass rolls smoothly through S.F. It's 5 p.m., do you know where your bike is? Was that howl from a bicycle wheel? Call cops on bad drivers?